The tag line on Kareo's website says Medical Billing Made Easy. This is a web-based system that integrates medical practice management and billing with electronic claims processing, but doesn't include EMR/EHR. Kareo is able to interface with a limited range of EMR/HER applications, including Practice Fusion, Care360, WebPT, Electronic Medical Assistant, WebChartNow, VitalHealth EHR, and MD-IT. It's a Windows-based system that won't work with Macs unless they are set up to run Windows parallel to Mac OS. Oddly enough, their security policy page talks through many data protection features, but doesn't mention how often data is backed up. 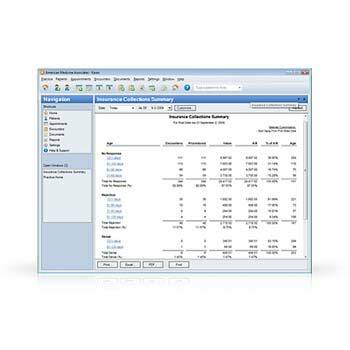 Dashboards: These are single-screen collections of short-cuts to the things you need to access most often, including management of to-do lists and key performance indicators. 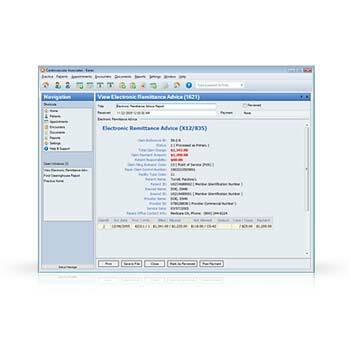 Patient Records: Single location storage and access for patient demographics, insurance policies, health information, patient alerts, financial history, and document storage. Insurance Eligibility: Real-time checking for invalid or insufficient insurance. Appointment Scheduling: Includes appointment scheduling, calendar viewing, schedule printing with forms, customized schedules and advanced rules for scheduling. Appointment Reminders: This occurs via email. Superbills: This feature helps to be sure you capture all the charges associated with a patient visit by narrowing code choices down to those that apply to your practice. They can also be printed from the scheduling feature either by appointment or another customizable time frame. Tasks: This feature allows you to create and track the tasks you need to complete or have assigned to others. Charge Entry: Allows for setup of fee schedules to reduce time spent entering charge data for each patient visit. Medical Coding: Allows for code checking against industry standards as well as the reimbursement rules of specific payers. Patient Statements: Can issue electronic statements that allow patients to pay online or do your own printing/mailing of paper statements. You can also outsource this to Kareo. Credit Card Processing: Allows for swiping debit/credit cards in front office or manual entry in the back office, online payments and auto-posting of payments made. Payment Posting: Allows for auto-posting of payments with ERAs, insurance checks from EOBs and patient payments; can also print receipts. Denial Management: Helps you identify, address and resolve root causes of insurance denials. Collections Management: Assists with following up on unpaid receivables. Fee Schedules and Contracts: Set up clear schedules of your practice fees, load insurance contracts and identify underpayments during posting. Electronic Claims: Submit claims electronically to more than 2,500 different government agencies and insurance companies and run reports on claim status. Electronic Remittance Advice: Allows for auto-posting of incoming insurance and other payments. Kareo is HIPPA-compliant and 5010-ready. Pricing information is laid out clearly on their website. The monthly subscription fee beings at $69 per provider per month for the basic service. But this doesn't include many of the features that most people would consider basic, such as electronic claims, which in the basic package will cost you .49¢ each. Additional tiers of service, each of which includes more features, are $149/provider/month, $199/provider/month, and $299/provider/month. Note that the first three tiers of service don't include telephone support, only email and chat. Although Kareo claims there are no set-up fees, this is not entirely true. If you want to have your existing data imported into the MedLedger system, it will cost $1,500 - and this is only after you spend a good deal of time getting your existing data into a format that Kareo can then import. Other features that result in additional charges regardless of the subscription level include patient payment services at $29.99/month and electronic statements at .25¢/statement. Unlike many vendors, there are many reviews on the Internet about Kareo. As with any product, some providers love it, and some hate it. However, two consistent elements of both good and bad reviews highlighted the slowness of technical support and the poor quality of the interface with EHR/EMR applications. Most subscribers only get email and chat support, and many reviews noted that response time was very slow, often days. The same was true even for those paying the top price that includes unlimited telephone support. The return call from Kareo can take days. Many of the good reviews found still noted that a major drawback to Kareo is that the interface with EHR/EMR needs major improvements.